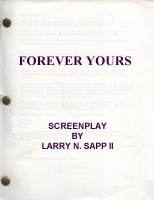 Click below to read script excerpts from "Forever Yours ." "Meet the Parents" meet "Guess Who's Coming To Dinner"
Despite using a wheelchair for his mobility, Neal Perry is very independent both personally and professionally, but that same independent spirit that catapulted Neal's career also causes him to believe he has to do everything twice as well to be considered an equal with able bodied persons and ultimately it threatens his relationship with his girlfriend, Paige Logan. Paige and Neal have been seeing each other for several months and have a very healthy and active relationship. Paige is a loving and helpful soul who loves and accepts Neal as a person and the time has finally come for him to meet her parents whom she has told nothing of his disability. They travel to her parent's home for a weekend filled with activities that including the family's favorite, water skiing at the lake. The weekend's plans ends with a beautiful banquet dinner and dancing to celebrate their 30th wedding anniversary. Although the family remains polite during the first awkward meeting, their feelings become quite clear and their concerns are only magnified by Neal's pride that causes an accident at his refusal to ask for help. Neal struggles with his desire for a wife, not a nurse or someone who has to help him. Neal reluctantly breaks it off with Paige because of these feelings and knows she deserves better. Even though she deeply loves him, Paige accepts that it may be more than he or she can handle. Going their separate ways, both are surprised by the return of their former love interests. Everything is complicated as Neal’s career is threatened and Paige seems to have her life planned out for her. With their life in a whirlwind, they must decide how far love will carry them. Can Neal love Paige, accept her helping hands without feeling like he is losing his independence or trapping her into a life of being a nurse? Can Paige love Neal for all the right reasons? Will Neal let Paige decide what is best for her, to be with or without him? And before they lose each other forever, will they learn that no one can do it alone? There is only one way to see if fireworks expload or will their lives only remember each other as a relationship they once had? Read the script! ? There is only one way to see if fireworks explode, or will their lives go on with them each remembering the other as the one true love that got away in this intriguing romantic dramedy that includes astonishing and authentic characters, a little romance, and a unique perspective from a man with a disAbility and those around him - wait for it to be coming to a theatre near you! Unless you are a key player inerested in helping to make this film project be produced - then request the screenplay! WAIT - WANT TO KNOW HOW TO HELP THIS FILM PROJECT? 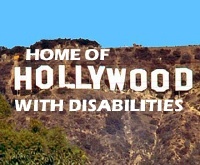 LINK TO THIS PAGE - Tell Everyone you know about the new representation for those with a disAbility!